The village of Kircubbin was only established in 1769 (nearly 250 years ago), and prior to this date the only reference made to a building in the vicinity is from the Ecclesiastical Taxation of 1306 as Ecclesia de Sancti Medumy, the Church of St. Medumy. The earliest mention of the area of Kircubbin is in about 1300, when it is referred to as Cubynhillis in tenemento do Ynchemkargy, which translates as Cubynhillis (Kircubbin) on the property of Ynchemkargy (Inishargie). Cubyn is clearly a source of the name Kircubbin, and Ynchemkargy refers to Inishargy, just up the road a little, which was an established settlement long before Kircubbin. Of course it’s easy to say that Kircubbin must be derived from Kirk – (the Ulster-Scots word for church), and cubbin – the church of cubbin, or perhaps Saint Goban (such as the Dublin and Kerry place-names of Kilgobbin, and Kilgoban). But there is no evidence to back this assumption, especially since there is no “g” in any documented forms of this place-name. There is certainly no historical evidence of a church by that name in the area. The only church would have been the Ecclesia de Sancti Medumy (the church of St. Medumy) which stood in an area known as Chapel Field, about 200 yards east of the present village main street (somewhere between the Parsonage and Lakeview House on Roddens Street). The only other church mentioned in the Ecclesiastical Taxation of 1306 is the church of Inyscargi (Inishargie). The form Cubynhillis is taken from a grant of about 1300 by William de Maundeville to the prior of St John the Baptist in Down (incidentally, the Knights of St.John were established from 1189 for 300 years, in a substantial preceptory near Cloughey, the ruins of which are nowadays referred to as Castle Boy); this form, Cubynhillis, is identical with modern Kircubbin: the fact that in this document, Cubynhillis is described as being in the tenement of Inishargie is very strong evidence that the place Cubynhillis and Kircubbin are in fact one and the same. However, this still doesn't answer the question as to who or what Cubyn was. Since the village of Kircubbin didn’t exist way back then, the obviously place to look for clues is Inishargie. 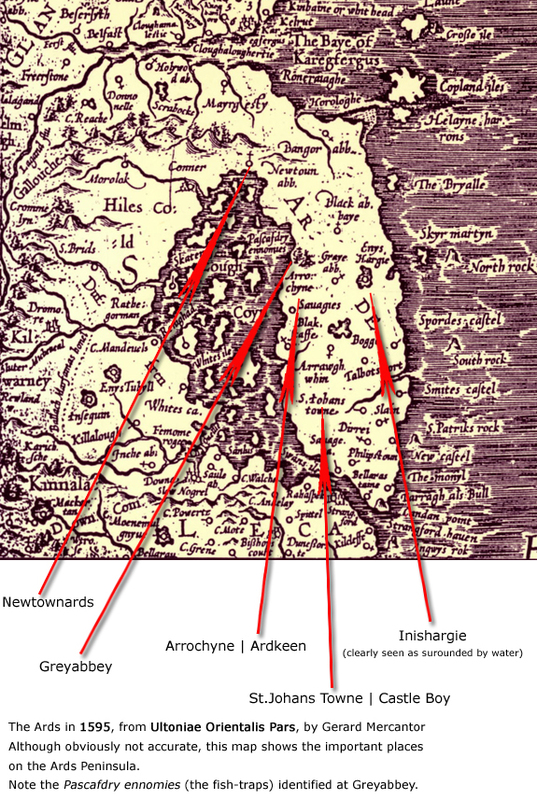 Inishargie was on the map long before a settlement is mentioned at Kircubbin. And this makes Inishargie very important in the history of the village. The earliest written record of Inishargie is from 1204 in the form, eeclesiam de Ynchemackargi (the church of Inishargie) as mentioned in the Papal chancery documents, Pontificia Hibernica of 1204. Inishargie takes its name from the Irish, Inis Mhic Cairrge. The Irish spelling of the time, Inis Mhic Cairrge, can be assumed to mean MacCairrge’s island hill (MacCairrge literal translation being: son of the rock, which sounds a bit odd, however names of this sort were common in early Irish). However this has been disputed to be inis cairraige, literal translation: the island of the rock or island hill, which in this circumstance refers to elevated land or a small hill surrounded by bog or water), which is still clearly visible about a mile up the Inishargie Road, on the right-hand side). The Ards Peninsula attracted the first settlers some time shortly after the Ice Age, about 7,500 years ago. These people were hunters and gatherers of food, living well off the plentiful fish and shellfish of the lough, and the flora and fauna of the land. These people later cultivated corn, domesticated animals, and lived in primitive houses. They were well organised, and raised stones of over 50-tonnes in weight to erect tombs, and built wooden defensive islands (crannogs). Dug-out wooden canoe from this period have been discovered in the mudflats around Greyabbey. Copper was mined near Portaferry, and tin was imported to mix with copper to manufacture bronze tools and weapons. Dolmens and standing stones were erected at Ballyhalbert, Quinton, and Ballyrussley. Hoards of bronze tools and weapons have been unearthed from this period at Glastry, and Conlig. The Celts arrived in this area of Down about 300BC. They built hill forts and created small settlements, notably one at Scrabo Hill, and another [near Kircubbin] at Ardkeen. *Ardkeen, just a few miles south of Kircubbin, was one of the most important strongholds of the ancient Irish, as they built two earthworks surrounding this site to protect themselves from the violence of the Danes (Vikings). The hillfort (Castle Hill) at Ardkeen is bult on a headland surrounded on three sides by water (or mud, when the tide goes out). This is a very important site that had previously been a royal site of the Ui Echach Arda in the early medieval period. This fist-shape headland at Ardkeen is still known by the Irish word : Dorn, which translates as Fist. Ui Echach Arda can be crudely translated as the O'Echach family, rulers of the Kingdom of the Ards. So this hill fort at Ardkeen (which you can clearly identify from the road as you drive towards Portaferry) was the seat of the kings of the Ards from about 400AD to the beginning of the late 10th century. The people of these times were clearly seafarers, because they named the lough Cuan, which is the Irish word for harbour, or haven, which is what it is after you navigate the Narrows. 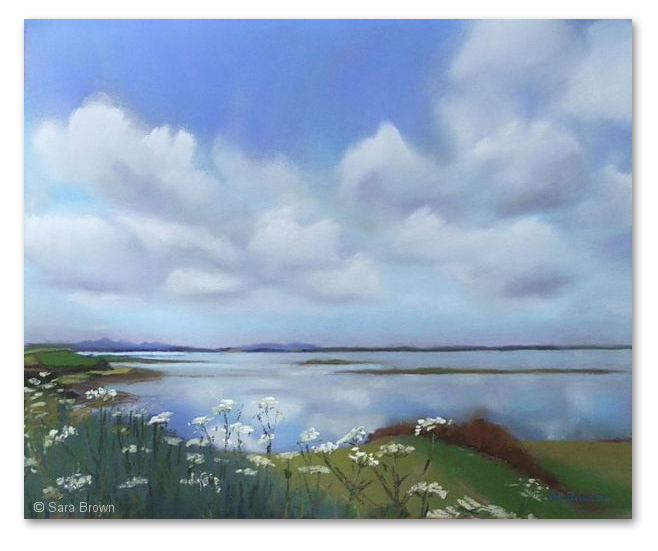 It is believed that this part of the Ards was inhabited by the Gaelic tribe of the Ui Thuirtre, [the descendants of Tort], apparently after Fiachra Tort, a fourth-century king and grandson of Colla Uais (died 336AD). A later sub-branch of the Ui Thuirtre were the Ui Fhloinn, anglicised to O’Flynn, and sometimes also used as the family name: (O’)Flinn, (O’)Flynn, and Lynn, of which there remain about ten families of this origin in the vicinity of the Ards. Although there were strong Viking settlements nearby at Ballyholme near Bangor, and Strangford village; there is no record of the Kircubbin or Inishargie areas being victimised, probably because there was little or no treasure for the raiders to profit from. In 823 the monasteries of Bangor, Downpatrick and Movilla were attacked by Vikings. In 876 the Vikings of Strangford attacked Armagh and took several monks captive. And in 926 a Viking fleet sailing through Strangford Lough was attacked by the Irish. Despite their relatively few numbers, the Vikings of Strangford would have held considerable dominance over the Ards Peninsula at that time. By 970 a military alliance had been agreed between the Vikings and the Irish, and the Vikings gradually merged into Irish society. In 1177 the Anglo-Norman knight, John de Courcy arrived in Ulster with 700 men. To consolidate his victory de Courcy installed the families of his followers in the area, and he installed the Savage family to control this area of the Ards Peninsula. The mid-Ards area (which included the area around Kircubbin) was granted to William de Mandeville, who, about the date 1300, gave the townlands of Kircubyn and Ballymullen to the Order of St.John the Baptist, in Down, who were at that time based at their stronghold at St.Johnstown, later called CastleBoy, near Cloughey. In 1310, Thomas de Mandeville was empowered by Richard de Burgo, Earl of Ulster, to negotiate with the Irish of Ulster. And in 1325, King Edward II granted to John de Mandeville the office of High Sheriff of Down and Newtown [Newtownards]. *A few miles south of Kircubbin, is the headland of Ardkeen, (a site that had previously been a royal site of the Ui Echach Arda in the early medieval period), and here in 1196 de Courcy built his principle motte castle, which in the 13th and 14th centuries became the caput of a mensal manor of the Earls of Ulster (the seat of legislative council of the Earls of Ulster). All that remains of the stone towerhouse is a demolished and overgrown pile, however just to the south side of Castle Hill still remains the old medieval church, Ecclessia Sanctae Mariae de Ardkene [the church of St.Mary of Ardkeen] which was built on the foundations of a much earlier church where the feast of St.Finnian of Movilla was celebrated each 10th September. This church later became the burial place of the Savage family. In 1561 Shane O’Nial had overrun the Ards, and having destroyed the surrounding country on every side, his forces lay siege to this tower house on Castle Hill, Ardkeen, but his attack was so vigorously repulsed that O’Nail was forced to retreat with great loss. In the 15th and 16th centuries this important stone tower house became the seat of the Savage family, whereupon Hugh Savage demolished the tower house on the hill summit, and had a substantial house built in a less exposed site nearby. The Savage family were appointed Lords of Lecale and the Little Ards, and their chiefs often acted as seneschals (royal officers in charge of justice and administration), and although the Savage family only owned the lands on the Ards south of the Blackstaff River (which enters the lough at Saltwater Brig), the Savage family held high authority over the people in and around Kircubbin. England dominated Ireland politically and militarily, and the Irish naturally enough resented this. In 1595 two powerful Ulster chieftains, Hugh O’Neill and Hugh O’Donnell, rose up and fought the Nine Years War against the English forces. This was the largest conflict of the Elizabethan period, and committed over 18,000 English troops in Ireland. The Nine Years War ended in 1602, with England close to bankruptcy as a result of it. The terms of surrender stated that the Ulster chieftains would be granted full pardons and the return of their estates in exchange for them abandoning their titles, disbanding their armies, and swearing loyalty to the Crown of England. As a consequence of this defeat and terms of surrender, distrust between the Irish and English was mutual (they really, really hated each other). O’Neill and O’Donnell and the other Gaelic lords left Ulster in 1607 (The Flight of the Earls) with the intention of sailing to Spain to organise a Catholic invasion of Ireland. This Spanish union and invasion never happened (Spain still had vivid memories of a very expensive failed attempt of invading Britain in 1588). And this Flight of the Earls left Ulster open for English dominance. The English Queen Elizabeth decided to attempt to control the Irish by planting English settlers in Ulster. And the Ards Peninsula was seen as a prize area: temperate, fertile, rich in timber, and convenient to the British mainland. In 1571, Queen’s principle Secretary of State, Sir Thomas Smith used his influence to secure Elizabeth’s favour for his plans for the Ards Peninsula and north Down. Sir Thomas Smith wanted these lands for his illegitimate son, also called Thomas Smith, and in October of 1571 the Queen of England granted land to Smith “in the Great and Little Ards”, with the promise of more lands if Smith’s plans for colonisation proved successful. The Great Ardes is the area roughly represented by present-day North Down and Ards Borough Council areas, as far down the Ards Peninsula to the Blackstaff River (at Salt Water Brigg). The Little Ardes is the area south of the Blackstaff River: a line that roughly goes from Salt Water Brigg, through Glastry where this river begins, and then in a straight line which follows today’s road from Glastry school to Ballyhalbert. As you might expect, Smith’s plans were not received with much enthusiasm in Ireland. Sir Brian McFelim O’Neill, whose family had owned these lands for over fourteen generations, was shocked at this betrayal by his queen, and pleaded with her to reverse her decision; but his appeals only resulted in a delay, and 16th September 1572 Thomas Smith arrived on the Ards. There was a stand-off between Sir Brian and Smith: threats, demands, and an English hostage was taken. Determined that the English should gain no benefit from their adventure into Ireland, Sir Brian’s force drove through the Ards Peninsula, confiscating all livestock, and setting fire to towns and villages, (killing Henry Savage on the way), and burning the abbeys of Newtown, Bangor, Movilla, Holywood, and every other building that might offer shelter or usefulness to Smith’s invading colonists. Sir Brian and Thomas Smith next turned to the Earl of Essex, (whom the queen had granted all of County Antrim), and they asked Essex to intervene to settle the land dispute. But Essex was unable to help, so Sir Brian resumed his offensive, and plotted the successful assassination of Thomas Smith at his house at Comber. Essex retaliated against Sir Brian who had fled to the lower Ards, and later met him near Belfast where they engaged in battle for two hours, killing over a hundred of Sir Brian’s men. In desperation Sir Brian turned again to Elizabeth, offering 1,500 cattle in the first year as rent to retain title to his lands, and what do you know, Elizabeth agreed, and in May 1574 Sir Brian was pardoned. 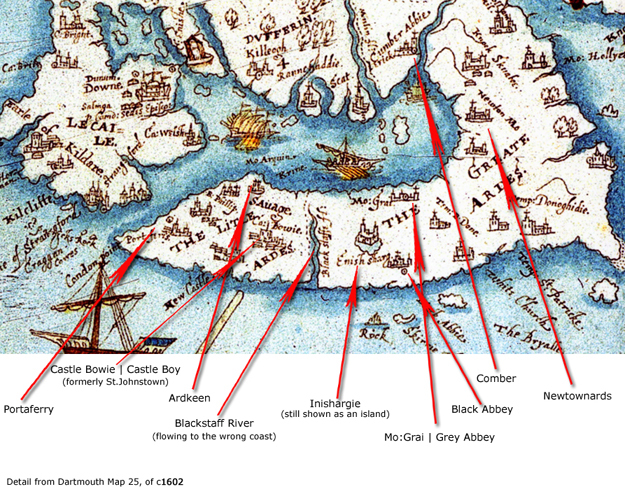 Despite this royal agreement, Sir Thomas Smith sent more English colonists to Comber to bolster the settlement and to re-establish his claim to the Ards; and a plot was hatched. In late 1574 Sir Brian was invited to spend a few days with the Earl of Essex at Belfast, and after three very agreeable days of drinking and making merry, the Earl and his men seized Sir Brian, his wife and brother, had 115 of his followers executed, and the prisoners sent to Dublin where they were executed and quartered. In response to this treachery, Fagarthagh O’Neill, the chief Clannaboy O’Neill in the Great Ardes led a rising that drove out the English colonists at Comber, chasing them down the Ards Peninsula and into the protection of the Savage family at Ardkeen. 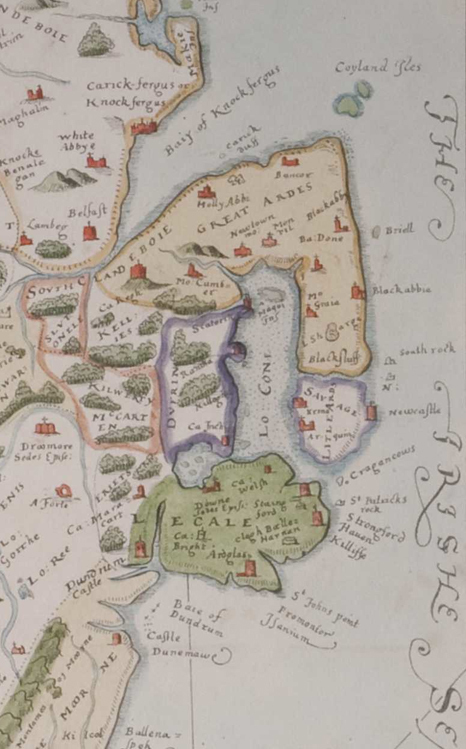 In July 1575, Essex made a deal with O’Neill whereupon it was agreed that O’Neill would become lord of South Clannaboy (from north Down, to the Blackstaff River on the Ards Peninsula), while the son of the late Sir Brian, Shane McBrian, would become lord of North Clannaboy (which extended from Belfast to mid-Antrim). Queen Elizabeth died in 1603, and was succeeded by James VI of Scotland, James I. This Scottish king on the throne of Great Britain was a game-changer, and immediately seized upon as an opportunity by those seeking to profit in Ulster. James I re-granted the Gaelic lords of west Ulster their lands, and granted the O’Donnells the lands from mid- to north-Antrim. There were at this time two Scottish landowners, with some influence with the new king, both of whom had their sights set on acquiring land in Ulster: James Hamilton, and Hugh Montgomery. Montgomery was approached by the wife of Con McNaill Oge. McNaill had been imprisoned at Carrickfergus Castle for the past 20 years, and his wife asked Montgomery to break him out of jail; Montgomery’s reward for the release of McNaill would be half of McNaill’s lands in County Down. Montgomery (who had previous experience of jail-breaking) agreed, and with the help of his friend and neighbour, Thomas Montgomery, they successfully broke Con McNaill Oge from his imprisonment, escaped to Scotland, and thereon to London to request a Royal Pardon, in return for which Hugh Montgomery would his receive his reward. However, James Hamilton was also very close to the king. In fact James Hamilton had been engaged as a spy at Dublin, on behalf of Queen Elizabeth, (Hamilton was represented in the secret service records by the signature of an entwined 4 and a reversed 9). When James I came to the throne, there was no need for Hamilton to stay in Dublin: he was knighted by the king, and sought reward for his services. And, naturally enough for a spy, Hamilton was aware of the deal agreed between Hugh Montgomery and Con McNaill Oge. Hamilton’s colleague and fellow spy, Fullerton, convinced the king that Montgomery would receive too much land, and suggested that the estates should be divided to include Hamilton. King James promptly replaced the agreement with Montgomery with one entirely in the name of Sir James Hamilton who was bound to convey lands to Montgomery and Con McNaill Oge. Montgomery didn’t have any choice in the matter. And this three-way split is what was [reluctantly] agreed to on 31st April 1605: Con McNaill Oge took back his lands in North Clannaboy, and the lands of South Clannaboy were split between Hamilton and Montgomery. And this is how Fagarthagh O’Neill’s lordship of South Clannaboy ended abruptly. The division of lands between Hamilton and Montgomery was not a neat one, with townlands here and there throughout north-eastern County Down. Hamilton took lands, including: from Killyleagh to Ballygowan; Holywood to Groomsport; Ballywalter to Portavogie, including Kircubbin. Montgomery was granted lands in a swathe, including: from Comber to Donaghadee, Newtownards and Greyabbey. So by 1606 theKircubbin area was under the new lordship of Sir James Hamilton. Centuries before the founding of Kircubbin, this area was within the parish of the Priory of St.Andrews. In the year 1183, John de Courcy [see Early Settlers, above] granted ten carucates (one carucate is the area of land ploughable by a team of eight oxen in one season = approximately 120 acres), (about 1200 acres) to the Benidictine abbey of St.Andrew's in Stogursey in Somerset, England, which was de Courcy's family seat. This ecclesiastical property on the Ards is what was known as the parish of St.Andrews. The Priory of St.Andrew's of the Ards was founded by John de Courcy on 26th May 1204. The parish of St.Andrews united the townlands of Whitechurch, Ballyhalbert, and Inishargy. And it was this parish of St.Andrews that formed part of the possessions of the Benedictine monastery founded as a cell to the Abbey of St.Mary, at Lonley, in Normandy, France. I know what you're thinking: where is this lost abbey of St.Andrews? Although St.Andrews is designated in the charter of foundation as the Abbey of St.Andrew de Stokes, it is better known (even since the post Anglo-Norman times) as the Black Abbey, (the little remains of which lie between Ballywalter and Greyabbey; as you might suspect, on the Blackabbey Road). After King John of England lost Normandy to the King of France in 1204, Norman ecclesiastical houses became regarded as alien priories, because the priory's mother house was in Normandy, which was no longer under the control of the English crown. And this is why the abbey was seized into the hands of King Richard II as an alien priory in 1365, and was granted to the Archbishop of Armagh, who took possession of it within his episcopal jurisdiction. After the Dissolution of the Monasteries by Henry VIII in the 1530s, Black Abbey fell into the hands of the Clandeboye O'Neills [see the English Plantation, above], however after the Nine Years War [also as above] the lands again reverted to the English crown, and were subsequently granted to Sir James Hamilton [see Scottish Plantation, above], who assigned the lands to Hugh Montgomery. After a lot of hoohaa, in 1639 it was finally awarded to the then Archbishop of Armagh. I apolgise if this description of the ownership of the parish St.Andrews reads somewhat complicated: actually I have simplified the facts. Disputes over the ownership of the priory and lands continued from 1365 until 1633, but I'm afraid that further elaboration may send you to sleep. Black Abbey is long gone, however there remains an active Saint Andrew's Church of Ireland at Balligan, just a couple of mile outside Kircubbin, which was built in 1704 on the site of an earlier 13th century church. To explain the origins of Kircubbin you need to know about Inishargie, because without Inishargie, and its new owner, Kircubbin may never have been developed. In the wee town of Dunragit, between Stanraer and Glenluce, Wigtownshire, in south-west Scotland, lived a wealthy family called Baillie. The Baillie family had engaged the services of a local clergyman to tutor their daughter. However, this clergyman assaulted the daughter, and in revenge three sons of Baillie mutilated the clergyman, who subsequently died of his wounds. The three Baillie sons scattered, fleeing from the law: one fled to Inverness; another to Anglesey, and the third, Alexander Baillie, fled to the Ards Peninsula, arriving here in 1628. Alexander Baillie had to alter the spelling of his name from Baillie, to Bailie to evade certain legal difficulties in the purchase of landed property. He was obviously wealthy, because Alexander Bailie purchased land from Hamilton, acquiring the title to the townlands of Inishargie, Gransha, and Ringdufferin. The house that Alexander Bailie built for himself at Inishargie was substantial, and probably followed the footprint of the old medieval church. Bailie’s house was described at the time as having “stout foundations, a central portion containing the hall, then from either side two large wings, each containing as many as 20 rooms, jutted out at right angles enclosing a rectangular piece of ground which was moulded into terraces. Over these terraces strutted peacocks. While from orchard, laden deep with fruit came the perfume of a host of flowers. Behind the house lived the retainers in a long, low, stone building at the end of which stood a bell tower. Coach houses and runs for hounds formed the other side of the courtyard, while byres and stables for many horses formed the third side. Behind the retainer’s quarters stood a flower garden with ornamental walks and summer houses, from which could be caught a glimpse of the lake with its graceful swans and ornamental water fowl. 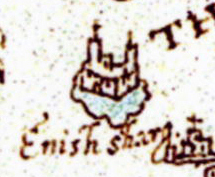 So, going back to the original meaning of Inishargie, ‘the island of the rock’, in 1628 when Alexander Bailie arrived there, it was still a small hill [almost] surrounded by water. Bailie drained the water and reclaimed the land, “and where once was a barren swamp, there lay verdant fields”. It seems incredible looking at Inishargy today to believe that there ever existed a lake at that location. But look at the map illustrations [in articles above] and you will see Inishargy clearly identified as an island on a lake. Montgomery lands included two excellent sources of rock for building: Scrabo Hill, and a slate quarry at Greyabbey. However, Hamilton lands had no natural sources of rock. James Hamilton excavated the coastline at Bangor (the Long Hole, at Seacliff Road) to build his castle at Bangor. And Bailie had built his great house at Inishargie with the remains of the previous medieval church. Even by the year 1653 when James Hamilton died, these were still the only two stone houses on Hamilton Estates, the rest of the houses being built of mud. The Bailie family remained at Inishargie, and remained influential in the mid-Ards area for several generations. 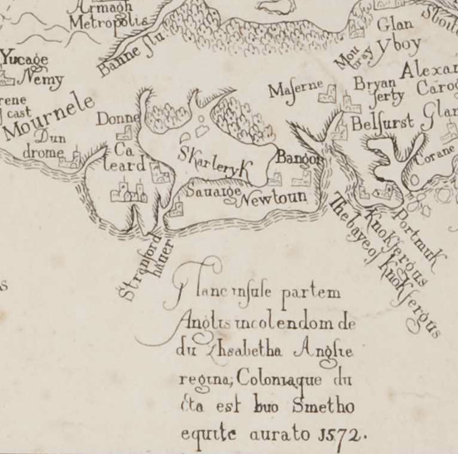 Alexander Bailie fled from Scotland to Inishargie, Ards in 1628. John inherited Inishargie, and married Catherine Cary of the Raplock branch of the Hamilton family (thereby becoming very influential, managing the Hamilton estates). James Bailie, born 1653, (High Sherriff of County Down from 1697), died 9th July 1710. Married to Jane Annasley (born 1661), daughter of Sir Francis Annasley of Castlewellan . ....and five other children unnamed. It was this son of John, James Bailie MP, (born 1724), (great-great-grandson of Alexander Bailie), who established the village of Kircubbin in the year 1769. 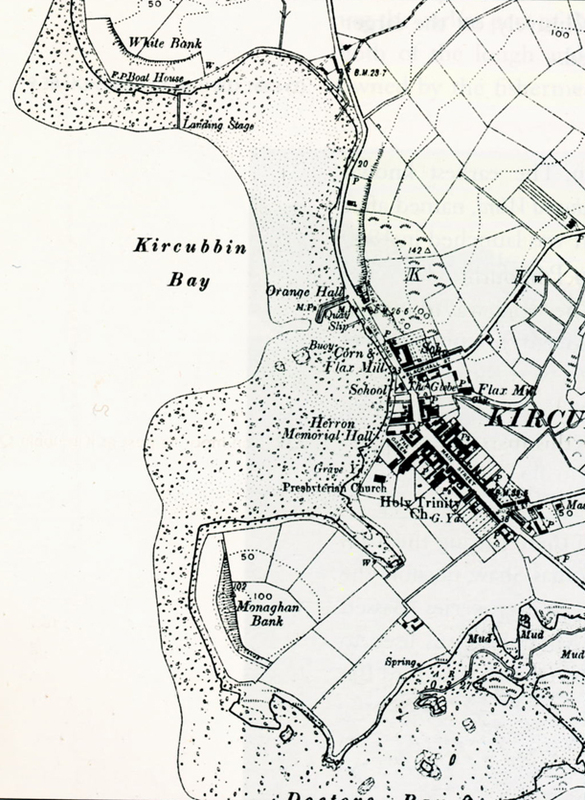 If you know the waters of the Ards Peninsula, you will appreciate the location of Kircubbin. On the sea-ward side of the peninsula there are many excellent beaches where ships could be beached at high-tide for unloading, but this Irish Sea coastline can be swept by gales and big swells, making berthing and beaching hazardous. On the lough-side of the peninsula there are only two practical places where a large vessel can approach land in deep waters close to the shore: one is Portaferry, and the other is Kircubbin Bay where a depth of 22-metres can be found close to shore, allowing ships of 100-tons to anchor safely. 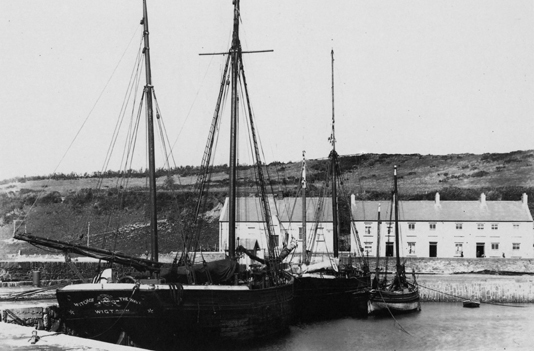 Ships (even in living memory) could safely beach themselves on the shore (infront of the where the car park is today), and James Bailie built a stone quay that allowed vessels to dock at high tide. All other landing places on this side of the peninsula are shallow, muddy, and exposed, and this naturally meant that Kircubbin Bay became an important harbour for import and export on the Ards Peninsula. James Bailie obtained a patent to hold four annual fairs (in April, May, August, and November) and a weekly market in Kircubbin, and in 1769 he divided the land there into building lots, each comprising two-acres. And to encourage building and settlement on his land, Bailie leased the lots at very low rates, and the fairs were free from customs duty for a period of seven years. Having created a little village with prosperous potential, James Bailie sold Kircubbin in 1786 to Robert Edward Ward of Bangor Castle for £36,000 (equivalent to about £5-million pounds in today’s currency). And then James Bailie sold Inishargie House to the Rev. Charles Ward. And that is how the wee town of Kircubbin came into existence. I don't have a photograph of a vessel beached on the shore at Kircubbin, but this picture (taken as late as 1939) demonstrates the simple idea. The 1641 Rebellion was caused by the failure of the English and Scottish settlers [explained above] to sympathetically assimilate with the native Irish upper classes of Ireland. However, the Scottish settlers, since arriving earlier this century, had managed to integrate quite successfully with ordinary Irish, and intermarraige was commonplace. The problem was with the Irish upper-classes. The plantation had hit the Irish upper classes the hardest, most of whom were dispossessed, particularly in Ulster and Munster. The other contributing factor was religion: The Irish natives were Catholic, however, Anglicanism was the only approved form of worship, and non-attendance at a Protestant Church of Ireland service was punishable by 'recusant fines'. Catholics could not hold senior offices of state, nor serve above a certain rank in the army. And despite the fact that the Irish House of Lords still had a considerable Catholic majority, the Privy Council and Irish House of Commons was dominated by Protestants (by means of altering constituences (see: gerrymandering). So the lid blew in October 1641, with widespread attacks by the native Irish population on the English Protestant settlers, and later on the Scottish settlers too. It is estimated that perhaps 12,000 Protestants may have been killed during this rebellion, many of whom had been dispossessed of their property, and left to survive without shelter in the depth of the winter of 1641/42. A quick defeat of the Irish rebels was prevented by the outbreak of the English Civil War in mid-1642. English troops were withdrawn from Ireland in late-1642, however by the summer of 1642 the Irish Catholics controlled more than two-thirds of Ireland, and the rebellion had become a conventional war between Irish and British-controlled enclaves in Ulster, Dublin, and Cork. The Irish had formed a Conferderation in May 1642. And this Irish Confederation sided with the Royalists in the English Civil War, in return for the promise of self-government and full rights for Catholics after the war was won. However, as you should know, Charles didn't win: Oliver Cromwell's New Model Army won the English Civil War, (and chopped off King Charles' head). And then Cromwell invaded Ireland in 1649 to ruthlessly crush the alliance of Irish Confederates and royalists. Cromwell's success meant the end of the Irish Catholic land-owning classes, and the introduction of more wide-ranging Penal Laws, (explained in more detail with the 1798 Rebellion). A census of the Kircubbin area in 1659 states a population of no more than 9 people, however, this number may not include native Irish, as they would not have been included in a population count. In any case, due to this small population, this part of the Ards was largely unaffected by the Civil War, although there is little doubt that men of fighting age from the Ards fought (on both sides) during the 1642 campaign in east Down. Taxation was heavy on the Ulster-Scots population of Ulster during this warring decade, and caused a period of economic stagnation; furthermore many landowners of the Ulster Plantation were forbidden to take native Irish as tenants, and Montgomery had gone further, forbidding his own lessees from taking native Irish sub-tenants. Other factors affected the Ards at this time: the Civil War had drained the economy of capital, but also of horses and cattle; would-be settlers from Scotland were dissuaded from emigrating to Ulster because they were draining the resources of Scotland, and to add to these problems there had been a history of harvest failures throughout the 1630s. During the Civil War, Montgomery had unflinchingly supported the King, and as a result he had suffered: defeated by English republican forces at Dundalk, and at Lisburn in December 1649. Montgomery subsequently found himself surrendering to Oliver Cromwell. Montgomery suffered for his royalist support: he was heavily fined, and imprisoned at Dublin until 1656. However, after Oliver Cromwell’s death in 1658, his son, Richard Cromwell struggled to maintain authority, and in 1659 the republican Protectorate was abolished. And the British monarchy was restored in 1660, with Charles II crowned king. Charles II rewarded Montgomery for his loyalty to the throne during the Civil War by making him first Earl Mount-Alexander, and soon his wealth was restored to him. In 1685 Charles II was succeeded to the British throne by his Roman Catholic brother, James II of England. Having a Catholic king made the Ulster-Scots settlers very nervous, and by 1688 the Protestants of Ulster justifiably feared that the government intended to overturn all their achievements and end the plantation of Ulster. As you already know, James II of England had a daughter, Mary, who had married her Protestant cousin, the Stadtholder of Holland, William Prince of Orange. And in 1688 by kind invitation of English Protestants, the Dutch prince invaded Britain with a force of 11,000 foot-soldiers, and 4,000 horse soldiers. It was in their own personal interests for the Ulster-Scots settlers of the Ards and elsewhere to support the invading Dutch prince when the army of James II was chased out of England and into Ireland, and many Scots immigrants took up arms to swell the ranks of the Williamite army at the Battle of the Boyne in July 1690, where the Dutch prince defeated James’ army and sent him fleeing into permanent exile in France. And the dutch Prince William became king of England. By 1837 Kircubbin was described (in the Topographical Dictionary of Ireland) as containing 117 houses, with a prosperous trade in straw hats and bonnets that had developed, with straw being imported from England, and the finished hats and bonnets being sent off to England, Belfast, and Dublin. In 1839 it was estimated that this straw hat industry brought an annual income of £10,000 into the Kircubbin area, (equivalent of about £900,000 in today’s currency). Kircubbin also produced linen. Enough linen to require the building of a dedicated linen hall, which is unusual, as at that time (apart from Banbridge) other linen markets in County Down were held in the streets. The Kircubbin linen market operated twice weekly during the 1830s. One thousand webs were sold here at the turn of the 19th century. The linen was brown (unbleached) linen, which was sent to the merchants in Belfast for finishing. The women spun flax into linen tread, and their husbands then wove the thread into cloth. However, after 1829, when the Mulhollands of Belfast (Andrew Mulholland later became Lord Dunleath at Ballywalter) introduced spinning machines and cotton thread, women on the Ards found flax-spinning less profitable and turned to embroidery. Embroidered trims for clothing and linens became fashionable in France during the reign of Napoleon I, and the fashion quickly spread to the upper classes of Britain and America. Parcels of muslin were brought to the Ards from Scotland for the delicate white embroidery known as sprigging, flowering, sewing, parcelling, white-work, or scotch-work. The Ards became a centre of renown for the production of this craft: tiny girls who did simple veining, and older girls and women who did the sewing and ‘opening’ and ‘tamboring’. By 1840 it was estimated that in the greater Ards as many as 3,000 women embroidered for Belfast merchants, and 10,000 women embroidered for Glasgow merchants. As you can tell by the numerous windmill remains on the peninsula, the Ards was a productive corn-growing region. Early on, Ards corn was dispatched from Kircubbin by boat for the mills in Comber, until ultimately two corn mills were built in Kircubbin: a windmill a short way up and to the left on Rodden Street; and a water-powered mill that stood by the shore, (just about where Kieran McCarthy lives today). The farmers of the Ards produced a variety of produce for home consumption, and marketed the surplus. Intensive cultivation of small farms was normal. By rotating crops, using potato as a soil-cleansing root-crop, and applying fertilizers such as lime, guano, compost, manure, and seaweed, farmers increased their productivity per acre. Labour-intensive farming like this was common throughout Ulster at this time, however, the farms of mid-Ards were notably more productive. The livestock census for County Down of 1803 showed that cattle predominated in the north-west of the county in numbers of 15 to 14 head of cattle per hundred acres; in mid-Ards the average exceeded 25 head per one-hundred acres. This increase in productivity was not just because of the rich farmland of the area, but can also be attributed to the fact that exporting produce was made convenient by the port of Kircubbin. The other ports in the area being Donaghadee, and Portaferry. Oats and wheat and potatoes produced around Kircubbin were more effectively marketed to other regions of Ireland and Great Britain because of the port facilities of Kircubbin, thereby offering a better price for the produce because they were not just selling locally. Horses were popular in this area of the Ards. In 1803 horses were rare in County Down, with the major exception being the mid-Ards area around Kircubbin, which boasted 10-15 horses per one-hundred acres. Following the ploughing season, many of these horses were sold to the carriage market. Great quantities of kelp were burned to produce soda ash, which was exported from Kircubbin to linen manufacturers of County Down, and the glass industries of Dublin and Bristol. Kelp was a big business on the Ards. This brown seaweed, which is still regularly seen dumped onto beaches after a storm, is valuable, and made many men of the area wealthy. Kelp was grown as a commercial crop on the seashore. Evidence of this is still clearly visible on the south side of Kircubbin Bay, where you can see for yourself, rows of rocks neatly positioned in-line. These rocks were once used for seeding kelp (a bit like growing potatoes in rows). Burning this brown seaweed creates Sodium Carbonate, better known to you and me as washing soda, or soda ash. Soda Ash is an important ingredient used in the manufacturing of Glass. It is also used in some cooking to regulate acidity; and it is used in taxidermy. In the home, washing soda is used as a water-softener, and a descaling agent in water boilers. In the textile industries, soda ash is used as a bonding agent for dyes. The production of Soda Ash was an important industry on the Ards Peninsula. A large kiln can still be seen on the shore at Ballywalter, another small kiln can be seen near Kearney, and a kelp house still stands on the shore just to the south of Greyabbey (the last building on the right as you leave the village, southwards). The Ards continues to be good agricultural land, and was considered by valuators in 1836 to be better than most land in the country. The Ards Peninsula offers good tillage due to having the least rainfall of all Ireland, and the longest growing season of any part of Northern Ireland, with crops typically ripening a fortnight before crops in the rest of County Down. 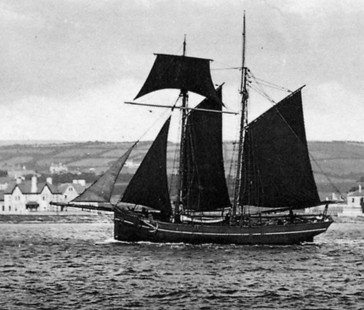 Witch of the Wave, was built 1856, and owned by Elliot of Portaferry. Because Kircubbin is a lough port it is sheltered from the storms and big swells of the Irish Sea that make berthing ships on the sea-side coasts more hazardous. The port of Portaferry does not offer a safe shore to beach a vessel. It had three quays, however the surging tides made berthing a vessel difficult. Between the years 1833 and 1867, seventy vessels were wrecked and forty-three lives lost to those fishing out of Portaferry alone. The port of Donaghadee also offered excellent shores for beaching vessels, as well as one of the busiest harbours in Ireland; but Donaghdee was too far away to make a cost-effective journey to the port from the mid-Ards. Kircubbin offers deep water close to shore that allows large vessels to moor conveniently and safely. The quay could accommodate vessels with a draught of 3-metres at high tide. Throughout the centuries, the Ards has remained relatively peaceful. Religious strife between Protestants and Roman Catholics was limited to a few specific cases, and it is safe to say that Presbyterians were more apt to fight amongst themselves than vent their anger on neighbouring Catholics. The upsurge of evangelicalism in the 1820s, however, is an important component of the ideological background of emigrants. Three-quarters of the emigrants from the mid-Ards area who went to Amherst Island, (an island of 16,000 acres on Lake Ontario, Canada) were Presbyterians associated with the synod of Ulster; they took with them a degree of tolerance towards Catholicism reminiscent of events leading up the Rebellion of 1798, and the evangelical belief in the importance of salvation through faith. Presbyterians in the mid-Ards numbered 5,300, and comprised 68% of the population. They had five meeting houses: congregations in association with the synod of Ulster had churches in Kircubbin, Glastry, and Ballywalter; Remonstrant Presbyterians established a congregation in 1834 at Ballyhemlin; and Independents met at Ballywalter. 384 persons (5% of the population) met at St.Andrews Church of Ireland at Balligan. Roman Catholics numbering 1,307 (17% of the population) worshipped two-and-a-half miles south of Kircubbin at Lisbane Church, in the Roman Catholic parish of Ardkeen. Wesleyan Methodists, numbering 793 (10% of the population), had no meeting house but formed societies that met regularly in the homes of members throughout the parish. The Presbyterian Church, with its self-supporting and democratic nature, is said to have nurtured a fierce ideological independence in its members, and the mid-Ards became one of the hotbeds of rebel support for the United Irishmen leading up to the Rebellion of 1798. While the Loyal Orange Lodge was spreading throughout mid-Ulster, United Irishmen in the Ards wanted to democratise Parliament to reduce the power of the Church of Ireland, and to extend political and religious liberties to Roman Catholics and other Dissenters (other non-Anglicans). In 1796, men for Inishargie and Ballywalter, armed with pitchforks, joined other insurgents and attempted unsuccessfully to overcome government forces at Portaferry: nine men from Ballywalter were killed, and many wounded. In the aftermath, government soldiers scoured the peninsula destroying grain, demanding liquor, and harassing women and children. One leader, Robert Gowdy of Donover, near Ballywalter, was court-martialled; and the other leader, Archibald Warwick, a teacher and licentiate of Kircubbin Presbyterian Church, was hanged in his own church yard. A law had been passed in 1770 that necessitated security for £50 a year as stipend, which needed to be secured before a new congregation could be formed. However, James Bailie of Innishargie informed the Synod that he joined in the application from Kircubbin, and that he would provide security for this £50. The first minister of Kircubbin Presbyterian Church was Reverend G. Brydon. However, because this church was not recognised by the Synod of Ulster and the church was not under their care, the church did not receive the Regium Donum (the annual donation from King William III paid to support Presbyterian meeting houses, in compensation for the tithes that they were expected to pay in support of the Church of Ireland [see Penal Laws, below] ). Robert Edward Ward built Holy Trinity, Kircubbin Church of Ireland in 1843. However, curiously enough, because most of his tenants were Presbyterian, Ward also paid the £10 salary of the Presbyterian minister of Kircubbin Presbyterian Church [mentioned above]. Roman Catholic Mass was at one time heard in a store in Kircubbin before James Allen of Nunsquarter donated the grounds and contributed to the erection of a Roman Catholic chapel, Saint Mary Star of the Sea, in 1855, consecrated in 1865 when Rev James Crickard was Parish Priest. A school was built beside it in 1870. Kircubbin Community Church was planted in Kircubbin in September 2006, the parent church being Hamilton Road Baptist Church, Bangor. Initially gathering in the house of local school teachers, Phil and Sharon Derrick, as numbers grew the church moved to larger rented halls in Kircubbin, and presently meets in an upper room at Maxwell Court on the Main Street. With a keen interest in benefiting the community, Phil and Sharon Derrick had already founded the local children's activity group, WhizzKidz in 1997. WhizzKidz continues to be organised by Kircubbin Community Church, and regulary attracts over 100 children to its summer scheme; as well as organising weekly meetings during school term-time. Prior to 1829, the only school outside Newtownards was one sponsored by James Hamilton, at Ballyhalbert. In 1829 a second school was established on the Honourable Robert Ward’s property in Kircubbin under the joint management of the Rev. F. Lascelles (the vicar of St.Andrews, Balligan), and Rev. McEwan, Presbyterian minister. In 1834, John Echlin erected a school at Echlinville (Rubane). After the National Schools Act of 1831, several new schools were created. To explain the 1798 Rebellion I need to take you back a further two-hundred years to 1594, and tell you about the Penal Laws. Now, don’t think that these Penal Laws were just something from way back when: these Penal Laws were only fully repealed in 1920 (which is still within living memory, if you’re very old). As a consequence of this defeat and terms of surrender, distrust between the Irish and English was mutual (they really hated each other). O’Neill and O’Donnell and the other Gaelic lords left Ulster in 1607 (The Flight of the Earls) with the intention of sailing to Spain to organise a Catholic invasion of Ireland. Now skip forward to 1605. Remember Guy Falkes and the Gunpowder Plot: planned by a group of Catholics who intended to destroy the House of Lords during the State Opening of Parliament, to kill the Protestant king James I. The discovery of this Catholic plot against the king caused Parliament to introduce new anti-Catholic laws. English Catholics had fines and restrictions imposed upon them, and they were expected to swear an Oath of Allegiance. And the Catholics of Ireland suffered as a direct result of the English-led Gunpowder Plot, and this resulted in the subsequent attempts to control the population of Ulster by planting English and Scottish colonies in the province [see English and Scottish plantation, above]. In 1613 the constituencies of the Irish House of Commons were altered to give Plantation settlers the majority (look up: gerrymandering); Catholics were required to pay ‘recusant fines’ for non-attendance at Anglican (Church of Ireland) services, and; Catholic churches were transferred to the state church, the Church of Ireland. Catholic resentment of these Penal Laws was a factor in the Irish Rebellion of 1641, which was ruthlessly ended in 1653 with Oliver Cromwell’s conquest of Ireland. As a result, Cromwell imposed penalties, including death and sweeping land-confiscation, in the Act of Settlement of Ireland of 1652. This Act initially banned Catholics from living in towns ; and Catholic clergy were expelled from Ireland, liable to instant execution if discovered. Remember the Williamite War: James II of England got his pants kicked by the Dutch prince William of Orange, who then became William III of Great Britain. The main reason for the [invited] Dutch invasion of Britain had been to remove a Catholic king and replace him with a Protestant king. James’ army had been Catholic, and by fleeing to Ireland he had recruited the vast support of the Catholic majority of Ireland in his vain defence. As a result of this support by Irish Catholics, the new King William III introduced more Penal Laws. The Penal Laws were introduced to disable the Catholic community from reorganising themselves into a threat against the English conquering power. The Penal Laws extended to people who were not Anglican Protestant, (people who didn’t worship at a Church of Ireland service), and this included Presbyterians. After William III came to the throne, he compensated the Presbyterians of Ulster, (who had fought on his side against James’ army), not by excluding them from the Penal Laws, but by paying them an annual donation to support their church meeting houses, however Presbyterians were still expected to pay tithes in support of the Church of Ireland. So note that: despite a little royal favouritism, the Presbyterians (Dissenters) of Ulster were also suffering alongside their Catholic neighbours because of these Penal Laws. 1652, Catholics were barred from membership of the Parliament of Ireland. 1696, the Education Act forbade Catholic from sending their children abroad to be educated. Catholics and Dissenters were banned from studying at Trinity College Dublin. 1703, the Popery Act ensured that when a Catholic died, his estate was divided equally among his sons, unless the eldest converted to Protestantism, in which case he could inherit all the property. 1704, the Registration Act required all existing Roman Catholic priests to register in their local magistrates’ court, to pay two £50 bonds to ensure good behaviour, and to stay within the county where they registered. 1707, Catholics and Dissenters were barred from holding public office. 1728, Disenfranchising Act excluded Catholics from voting. 1778, there was a ban on intermarriage between Catholics and Protestants. Presbyterian marriages were not recognised by the state. 1793, Catholics were barred from holding firearms or serving in the armed forces. Catholics were banned from buying land under a lease of more than 31 years. Ban on Catholics inheriting Protestant land. Prohibition on Catholics owning a horse valued at over £5. New Catholic churches were only allowed to be built of wood, and away from main roads. Catholics were forbidden to be schoolteachers. Some of the Penal Laws were slowly repealed after the death of the son of the former British Catholic king, James II (whom William had forced into exile in France). The Penal Laws began to be repealed because the Catholic royal Stuart family dynasty was therefore no longer a risk (although James’ grandson ‘Bonny Prince Charlie’ later led a valiant attempt at a rebellion from Scotland in 1745). But the repeal of Penal Laws was very slow, and strongly opposed by many influential Protestant politicians. And as I mentioned at the beginning of this chapter, the remaining Penal Laws were not completely repealed until the 1920 with the Government of Ireland Act. So that’s the background to the disharmony and distrust and discrimination that started the rebellion. In America, revolutionaries had issued the Declaration of Independence in 1776, and the American War of Independence of 1775 – 1783 had removed British rule from America. And in France, revolutionaries had issued the Declaration of the Rights of Man and the Citizen, [Déclaration des Droits de l'Homme et du Citoyen] in 1789, which started the French Revolution of 1789 – 1799. So the idea of a rebellion in Ireland against British rule wasn’t just a dream, it was being demonstrated abroad as something that was achievable. This thought of revolution inspired a small group of Presbyterian liberals in Belfast, businessmen and merchants of the town, who founded the Society of United Irishmen on the 14th October 1791. The Society of United Irishmen encouraged membership of Roman Catholics, Presbyterians, Methodists, other groups of ‘dissenters’, (and even found some supporters from the Church of Ireland). The aims of the Society of United Irishmen included democratic reforms, and Catholic emancipation (to set them free from legal, social and political restrictions). Turning to Britain’s enemy, France (with whom Britain had declared war in 1793), the Society of United Irishmen won French support, funding and military equipment. Not only did this foreign war against Britain encourage many Irish Catholics to train and fight on the side of the French, but the French were also encouraged to invade Britain through Ireland, where the French were promised majority support. However, this invasion of 1796 failed due to the weather, (as had also happen to Spanish Armada of 1588), and returned to France having lost 12 ships and thousands of men drowned in fierce winter gales. 1783, just ten years earlier, Britain lost America to a rebellion. Britain had been totally humiliated by this loss. You can bet your bottom dollar that the last thing Britain was going to allow to happen next, was the loss of Ireland. In response to this threat of a rebellion in Ireland, in 1797 Britain established military law throughout the country, but mainly in Ulster where the threat had originated. The British authorities used ruthless tactics to control trouble-makers: burning houses, torture, and murder. The Orange Order was established in 1795, with members loyal to the British monarchy, loyal to the Protestant Church of Ireland, and loyal to the British Government forces. The men who joined the ranks of the Orange Order had already been actively persecuting Roman Catholics throughout Ulster, under gang names such as The Wreckers, and The Peep O'Day Boys. The British government funded this new institution, trained them, and armed them. And soon the Orange Order quickly became instrumental in the eviction and persecution of Catholics in Ulster, with as many as 7,000 Catholics having been expelled from their homes in central Ulster in the 1790s. The British authorities used the Orange Order to drive a religious division within the Society of United Irishmen, between Catholics and Presbyterians. And members of the Orange Order were actively recruited to support the British Army where they proved themselves an “invaluable addition to government forces” who were ruthlessly controlling the population of Ireland. Over the course of the three-month rebellion of 1798, thousands of Irishmen were killed, both Catholic and Presbyterian, perhaps as many as 50,000 killed, (of which 2,000 were British military). So there you have a potted history of the 1798 Rebellion, and its causes. But what effect did this rebellion have on the Ards Peninsula? To be sure, the Ards Peninsula was a hotbed of support for the Society of United Irishmen. Though it is a fact that many of the insurgents came from Saintfield and Ballynahinch direction, by far the greatest number of those subsequently involved in the rebellion were from Ards, north Down and the Strangford Lough shore. In all eleven Presbyterian ministers, licentiates (trainee ministers) or clerical students from north Down and the Ards were thought to be involved. And given that the vast majority of the population of the Ards were Presbyterians, you can understand how this area became a hotbed of support for the United Irishmen. At a meeting of the Newtownards Volunteers on 22nd December 1792, resolutions were passed that demanded a change in Ireland’s constitution, they demanded thorough, adequate and effectual democratic reforms to the constitution of Ireland, stating that any reforms that excluded the emancipation of Catholics would not be adequate or effectual. Similar resolutions were agreed by volunteer companies of rebels in Donaghadee, Dundonald, Kircubbin, and Ballywalter, and the ‘Greyabbey Independent Villagers’, the ‘Freeholders and Inhabitants of Ballyhalbert’, and the ‘Comber Villagers’. In 1793, sixty Presbyterians from Kircubbin formed the Kircubbin Republican Guards, and resolved to free Irishmen from the chains of slavery. Now, around this time Lord Londonderry of Mount Stewart engaged the services of the Reverend John Cleland (the Church of Ireland minister of Newtownards between 1789 and 1809). Cleland was engaged by Londonderry as the official agent responsible for the collection of tithes (these ‘recusant fines’ imposed on people who did not attend Church of Ireland services [explained above in Penal Laws] ). Londonderry had purchased his 20,000 acre estates of sixty townlands, including Newtownards, in 1744, but he had found himself limited in his authority and in his ability to influence the politics of the area. So he had set himself up as leader of the Patriot Club in 1756, which was a liberal political organisation that you might have expected to support a rebellion. However when things heated up in the 1790s, Londonderry stood firmly on the side of the government: he began to demand the payment of tithes in 1792; and by 1795 he openly opposed parliamentary reform. By February 1796, United Irish sentiment was in evidence when Anglicans, Catholics, and Presbyterians met in Kircubbin to condemn the author of anonymous letters which had been delivered to Catholics in the area, which threatened them with destruction. There were also government-inspired handbills addressed to Catholics of the Barony of Ards, which were posted on doors, thrown into meeting houses and chapel grounds, warning that Catholics and Presbyterians were false friends, and advising them to “stand true to King George III, and to our younger brothers of the Church of England”. Lord Londonderry and Lord Downshire organised a meeting at Newtownards on 9th September 1796 to discuss raising yeomanry (a volunteer army), but the crowd that assembled were more interested in reform and the redress of grievances. Shocked by this rebelliousness, Londonderry, that same month summonsed several people of the area to appear before him to be examined upon oath to disclose all that they knew about illegal oaths and meetings and associations. And on 26th September 1796, Londonderry summoned his tenants to Mount Stewart in order to compel them to swear the Oath of Allegiance to the British crown. As you can imagine, Londonderry’s actions actually increased resentment against British authority, and in the parishes of Newtownards and Comber there was said to be nothing but “discontent and sedition”, and the prospect of raising yeomanry from the Ards was considered “totally out of the question”, due to the fact that so many people in this area were now card-carrying members of the United Irishmen. The United Irishmen of Kircubbin were particularly active, receiving instruction from their captains, to whom they swore oaths of implicit obedience. And bands of men were witnessed marching out from Kircubbin in ranks, playing a French republican tune on fife and drum. Remember Londonderry’s agent: Rev. John Cleland. An assassination was attempted on Cleland on 29th October 1796, however the assassin’s gun miss-fired, and Cleland managed a lucky escape. However this incident, and that of another man who was assassinated for taking the Oath of Allegiance, was the catalyst for Lord Londonderry and the Marquis of Downshire (the Governor of county Dow) to request military protection. As a result of this request, in November 1796 two companies of York Fencibles were sent from Downpatrick to Portaferry, Kircubbin, Comber, and Newtownards. This martial authority over the Ards Peninsula had, as you might appreciate, the opposite effect intended, and actually reinforced resentment against the government, and bolstered support for the United Irishmen. Rev. John Cleland remained active in the service of Londonderry. Government money was channelled through Cleland to enable him to organise and fund a ring of spies. By the Spring of 1797, prominent supporters and organisers of the United Irishmen had been arrested. However such was their support, that no jurors could be recruited to attend. And even when Rev. Cleland hand-picked loyal Londonderry tenants for jury duty, such was the influence of the United Irishmen, that none of the accused was convicted. In the summer of 1797, an itinerant friar, named McCary, arrived at Newtownards and spoke to crowds gathered in the fields around the town, urging the Presbyterians to union and brotherhood with their Catholic neighbours, on the grounds of Christian benevolence. On 11th October 1797, the French suffered a severe thrashing by the British Navy at the sea Battle of Camperdown. The French had been the main inspiration of the United Irishmen, (and the French had supported the Irish rebellion with money and military training and equipment, and had even attempted an invasion of Ireland in alliance with the United Irishmen). This sound defeat of the French was a great disappointment to the United Irishmen; and it was a cause for celebration by the British soldiers stationed throughout the Ards, who broke windows of nearly every house in Newtownards, and openly bullied the population. And this again reinforced resentment against the government, and bolstered support for the United Irishmen. On 9th of June 1798 men of the Ards gathered at Movilla, Greyabbey, Ballywalter and Kircubbin, and marched to Newtownards where they attacked the garrison based in the Market House on the Square, which had been left defended by just 20 invalided soldiers. The volunteers seized whatever arms and ammunition were left, and from there they marched on to Saintfield to reinforce their comrades were already engaged in battle against the British Army and local yeomanry. The British forces, under Colonel Granville Staplyton, had been successfully ambushed by the Irishmen, and only managed to escape having fired cannon and grapeshot into the ranks of rebels. The Battle of Saintfield was a victory for the United Irishmen, and they had the British Army on the run, apparently, with soldiers retreating from north-east Down and the Ards, so that by Sunday 10th June 1798, the whole of north Down and the Ards Peninsula was in the hands of the rebels. A key centre of rebel control was based at Innishargie, near Kircubbin, from where the rebels controlled access to the southern half of the Ards Peninsula. Six men appear to have been prominent at Innishargie: Robert Goudy, of Dunover; Archibald Warwick, of Six Road Ends, near Bangor, who taught in Kircubbin; John Dalzell; John Dorrian; Robert McCleary, and; William McMullan. The battle began on the night of 12th June 1798. As dawn broke on the morning of 13th June the battle recommenced with rebels attacked on two sides, ultimately resulting in the retreat of the United Irishmen, which quickly turned into chaos, pursued by regrouping British forces who quickly took advantage by turning this retreat into a massacre (some later reporting that battle losses were 40 British dead, compared to 400 rebels dead). The British forces sacked and burned the town of Ballynahinch. The British Cavalry [thought to be the 22 (Light) Dragoons] scoured the surrounding countryside for fleeing rebels, raiding homes, burning property, and killing indiscriminately. The Irish Rebellion in county Down was beaten. And next came the retribution. When British authorities resumed control a period of savage reprisals followed. However it must be noted in his defence that Lord Londonderry used his influence to reduce many sentences from death, to flogging. Remember Londonderry’s agent, and government spy, Reverend John Cleland: he was now appointed Judge Advocate, and presiding at court he sentenced many men to death, transportation, and flogging. Fourteen men of the Ards were sentenced to death by hanging, another four were sentenced to transportation to Botany Bay, Australia. David Bailie, who led the rising on the Ards, was eventually allowed to go into exile to America. General Cornwallis (who had surrendered to the American and French rebels in 1781 at the Seige of Yorktown, of the American War of Independence) arrived in Ireland on 21st June, shortly after the British victory at the Battle of Ballynahinch. Cornwallis was determined that he was not going to oversee another rebel humiliatation of Britain. He had been appointed Lord Lieutenant of Ireland, and Commander-in-Chief of Ireland (basically, he held ultimate power over the entire country). The French sent 1,000 French troops to Ireland in August 1798, with another 3,000 troops to follow, and in support of the Unitied Irishmen they enjoyed victory at Castlebar county Mayo, and Collooney county Sligo. However the French force was soundly beated by the English at Ballinamuck county Longford on 8th September; and the remains of the French force and Irish were again defeated at Killala county Mayo on 23rd September. A final attempt by the French to land an invasion army in Ireland was met with defeat again, this time at sea, at the Battle of Tory Island, off the coast of Donegal, on 12th October 1798. And that was the 1798 Rebellion (and how it affected the Ards) in a nutshell. General Cornwallis remained in Ireland, and used the ending of the Rebellion as an opportunity to force through the Act of Union on 1st January 1800, which created the United Kingdom of Great Britain and Ireland, (and necessitated the addition of that diagonal red cross to the Union Flag). Lord Londonderry, although seeming sympathetic at first, he soon became one of the princple players in resisting the rebellion on the Ards. However, once the dust had settled and the rebellion defeated, Londonderry demonstrated a desire to heal divisions between himself and the many families who had suffered during the rebellion. He opened free soup kitchens in Newtownards, and imported large quantities of provisions, which he sold at nominal price for the benefit of the whole community. He later provided work during difficult times, and lowered his rents. Reverend John Cleland profited from the rebellion. Cleland became a wealthy man of authority and influence, ensuring the conviction of the local United Irishmen; and in about 1800 he started to demand that Londonderry tenants pay their rents in gold, from which he also profited. Cleland was later appointed rector of Killevy and the precentorship of Armagh. He retired and built a mansion at the site of today’s Stormount Castle, (although it is believed that he remained as unpopular in Dundonald as he had been in Newtownards). Reverend William Steel Dickson, Moderator of the General Synod of Ulster in 1793. Dickson was reported to be one of the most active and persevering of the rebels in promoting the system of the United Irishmen and the Rebellion. Dickson was minister at Ballyhalbert 1771 – 1780, and minister at Portaferry 1780 – 1798, and throughout his career he gained a reputation as a radical and outspoken Presbyterian cleric. He took the test of the Belfast Society of United Irishmen in December 1791, and openly spoke out in favour of Catholic emancipation. As you can imagine, the British authorities kept a close eye on Dickson’s movements. Despite black propoganda against the United Irishmen, Dickson continued to support Catholic emancipation, and openly proclaimed and sought constitutional parliamentary reform. Dickson was arrested without warrant on the evening of 5th June 1798 at Spa, near Ballynahinch, and ultimately imprisoned on a prison-ship in Belfast Lough, where he remained until 25th March 1799, when he was shipped to Inverness, Scotland. Dickson was offered his liberty on the condition that he emigrate to a foreign land, an offer which he refused, insisting that he be brought back to Ireland to face trial. Dickson was returned to Belfast in 1802, and released on bond, on 13th January. Reverend James Porter of Greyabbey Presbyterian Church became a frequent contributor to the newspaper of the United Irishmen, the Northern Star. Using false names, Porter wrote several letters to this newspaper, exposing the infamous conduct of landlords and magistrates, making fun of Lord Londonderry, and referring bitterly to the behaviour of Rev. John Cleland. Porter was an educated man, not only a Presbyterian minister, he was also a talented lecturer in natural philosophy, including a study of electricity, hydrostatics, astronomy, pneumatics, mechanics, magnetism, and optics. Porter argued for parliamentary reforms, and the complete emancipation of Catholics. Porter remained at Greyabbey when the rebellion broke out in county Down, but he was accused of intercepting a letter dispatched from the garrison in Portaferry to Newtownards. And it was on this charge for which he stood trial, based on weak evidence from a loyalist yeoman. The Judge Advocate, Rev John Cleland, sentenced Rev. James Porter to death, and he was hanged on a temporary scaffold in full view of his house and church in Greyabbey. Archibald Warwick was a 29 year-old licentiate (a trainee minister with an academic degree) of the Presbyterian Church from Loughries, near Newtownards, who taught in Kircubbin. At his courts-martial in Newtownards on 15th August 1798, Warwick was charged with acting as a traitor and rebel, and endeavouring to excite treason and rebellion in Ireland. He was found guilty and sentenced to be hanged. Warwick was hanged on the 15th October 1798 on a temporary scaffold that had been erected in Kircubbin, between the Presbyterian Church and the manse (where the shore car park is today). As I mentioned earlier, Britain had very recently suffered a humiliating loss by rebellion of its American colonies. For this reason, the British responded with great force in their reaction to a similar rebellion in Ireland. And, as is the way, the victors subdued the memory of the 1798 Rebellion, despite the fact that it is estimated that over the course of the three-month rebellion of 1798, as many as 50,000 Irishmen, both Catholic and Presbyterian, were killed, compared to losses on the British side of about 2,000. 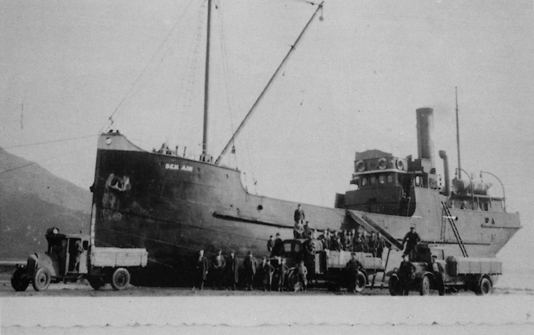 Smuggling has been common practice on the Ards throughout the ages. Not that everyone was directly involved, but who wants to purchase goods with the additional expense of government taxes? It was common practice to look the other way to protect the smugglers from the law, not just because this made the purchase of such common luxuries as tobacco, tea, and brandy more affordable; but it was also in your own best interests not to betray the identity of a smuggler to avoid very serious and violent repercussions. Kircubbin was a key route for the smugglers to the Ards, although they wouldn’t risk arriving at the quay in full view of the village. Instead the smugglers plied their trade via the inlet to the south of Kircubbin Main Street, known as Doctor’s Bay, which is easily accessible from the deep waters off Black Neb headland into the two shallow bays close to the road. When consignments of contraband were being moved by smugglers, a common practice was to place a coffin on the roadside at dusk. This abandoned coffin was enough to scare the locals into their homes, thus allowing the smugglers free use of the thoroughfare. Other locals were rewarded for their assistance and silence with a small share of the booty. Other tactics used by smugglers to scare away locals at dusk and keep the roadways clear for the unloading of loot, was to set one man on the shoulders of another, and dress these men as one giant of a man, thereby striking fear into anyone passing by and sending them running for home. One of the best-known descriptions of smugglers of Strangford Lough was told in the book, Daft Eddie, or the Merry Hearts of Down, by W.G. Lyttle, a tale later investigated and authenticated by the Mourne Observer newspaper. It is a story that takes place in and around Kircubbin, and worth areading. If you’ve ever heard about smuggling in and around Strangford Lough, you’ll have heard of Daft Eddie. And as you maybe already know, Daft Eddie came from the opposite side of the lough to Kircubbin, Mahee Island. Let me introduce you to the man known as Daft Eddie. Eddie was illegitimate by birth. His only known name was Eddie. As a baby, Eddie was presented to a childless couple who lived and farmed on Mahee Island, their names were Robert and Lizzie Barbour. A stranger had given the infant Eddie to Lizzie Barbour to raise, and tucked within his blankets was £50 [worth about £9,000 in today’s value], and a note explaining that more money would be sent twice a year to amply provide for Eddie’s upbringing. It was therefore assumed that Eddie must be the illegitimate son of a nobleman. And that’s why Eddie only had the one name. Eddie earned the prefix ‘Daft’ when he was a wee lad. Being of such value to his foster-parents, he was naturally spoilt, never asked to perform any work, so that his carefree attitude and happy-go-lucky outlook on life won him the nickname of Daft Eddie. Was Daft Eddie a smuggler? No. Eddie’s close friend, Willie Douglas was in league with smugglers; but Eddie played no active role in any smuggling or gang of smugglers. He didn’t need to: he was amply provided for. Around this time, around the 1780s, there existed a notorious gang of smugglers called the ‘Merry Hearts of Down’. These men were well organised under the leadership of the ruthless villain, Commodore Bob. All around the County Down coast, caves used by the smugglers are still well known: by the shorelands of Grey Point [at Helen's Bay], Jenny Watt's Cave at Carnalea, Pirries Castle, Bangor Bay, Groomsport, Donaghadee, Millisle, Ballywalter, Ballyhalbert, Ballyferris, Cloughey and as far as Ballyquintin Point. While among the many islands of Strangford Lough and the Strangford coastline there existed the perfect network of hiding places. Smugglers chased in open seas by the revenue cutters usually made for Strangford Bar without fear, even in stormy weather, laughing at their pursuers, who dared not follow into the often treacherous waters of Strangford Bar, around Rock Angus, past the sporadic whirlpools of the Routen Wheel, and the fast-flowing Narrows. Then, as now perhaps, evading tax was not seen as dishonesty, but a justifiable game of chance against the government surcharge on some of life’s simple pleasures. Many folk would see the smugglers, and yet not see; many folk would know of smuggling activities, but know nothing of it. Looking the other way was commonplace. However, the Merry Hearts of Down were not just smugglers evading customs duty on brandy, tea, and tobacco. The ‘Merry Hearts’ were altogether pirates. The Merry Hearts were feared by the people of Down, for they were known by their deeds: violence, pillage, robbery, kidnap, and murder. And it is the violent act of kidnap that brought the Merry Hearts to the townlands about Kircubbin. Their leader, Commodore Bob, had hatched a careful plan to sail to Kircubbin, and from there make their way under cover of darkness to the townland of Ballyeasborough with the intention of visiting the local magistrate, the widower Thomas McFadden who owned property and a large house called Oakville House, where he lived with his young daughter, Martha. The Merry Hearts’ plan involved robbing and pillaging Oakville, and the ransom Thomas McFadden. Through his friendship with Willie Douglas, Eddie became aware of this violent plot, and decided upon himself to warn the potential victims. Eddie sailed his little boat across the lough to Kircubbin, stopping at Maxwell’s ale-house for his supper before making his way on foot to Oakville House, at Ballyeasborough. At Oakville House, Eddie explained the wicked plot to Mr McFadden, and warned him of his imminent danger, before making his hasty escape least he be discovered as the traitor. McFadden immediately sent his daughter and housekeeper to Robb’s cottage nearby, escorted by two of McFadden’s men who would stay with the women until the all-clear was given. With the women he also sent his money, valuables, horses and other livestock. McFadden then summoned his four remaining labourers around him, and prepared themselves for a siege. Around 1am the Merry Hearts arrived, and surrounded the house. McFadden and his men were ready for them, but the pirates were not so careless. When the pirates realised that they had been anticipated, they caused alarm, which in turn caused the besieged to fire their weapons all at once, whereupon the pirate knew that they had opportunity to enter the house before the weapons could be reloaded. The Merry Hearts burst through a window and cudgelled the defenders into submission before tying and gagging them. McFadden attempted an escape, but he was outnumbered and suffered another heavy blow to the head before being carried away unconscious toward Kircubbin, where the pirate schooner was moored; meanwhile the remaining pirates waited behind to allow the kidnappers’ escape to the village before setting light to Oakville House. Only by the speed of reaction to the flames did neighbours reach Oakville House in time to pull out the remaining tied and gagged labourers, saving them from a cruel fate. Eddie returned to Robb’s cottage to warn McFadden’s daughter and housekeeper to remain hidden; but suspecting that Eddie was in league with the pirates the women sensed a trap and attempted their escape. However their attempt was short-lived as they encountered one of the pirates who quickly grabbed the daughter and made off with her to a hide-out in the Conlig Hills, where she was imprisoned by the notorious Commodore Bob. Realizing the danger that the daughter was in, Eddie, who had followed the kidnapper, waited for his moment before bursting in with three brawny farmers to rescue Miss McFadden from her inevitable fate at the hands of such a wicked man. Meanwhile, in a pirate hide-out near Scrabo Hill, the Merry Hearts holding McFadden forced their captive to write a letter to his friend Mr Matthews of Springvale House, Ballywalter, pleading urgently for a ransom of £500 to secure his release. The Merry Hearts of Down were not just smugglers. They were pirates of the worst sort whose reign of violence struck fear and terror into the hearts of the good people of Down. The burning of McFadden’s house at Balyeasborough was just another act of wickedness to add to their list. People who lived alone in remote parts of the countryside did not sleep soundly in their beds for fear of a violent visit from the Merry Hearts ; the mail coach from Downpatrick to Belfast had been robbed ; a house in Saintfield had been plundered and the occupants left bound and gagged ; a man was murdered in Loughries, his body buried and not discovered until long afterwards ; a schooner lying moored off Portaferry was boarded, the crew gagged and bound in the usual fashion, and the cargo pillaged ; a merchant named Morrison of Newtownards woken from his sleep and compelled to hand over his money ; and scores more stories of violence and pillage at the hands of the Merry Hearts created a legendary fear of these pirates, which they used to their advantage. A day or so after McFadden had written his own ransom letter, it was pirate gang-member, and friend of Daft Eddie, Willie Douglas who delivered the ransom letter in person to Mr Matthews at Springvale House, Ballywalter. Reading the ransom letter from his friend McFadden, Mr Matthews realized that Willie Douglas must be one of the pirate gang. However he also realized that Douglas must return with the ransom, or his neighbour might be murdered. Reluctantly Matthews handed a canvas pouch containing £500 in gold guineas to Douglas. Having counted the money, Douglas shoved the bag into his shirt and quickly made his way back to Kircubbin with the treasure. But he did not travel unnoticed. Keeping their distance from Douglas were six men following him, men loyal to Matthews, charged with discovering the whereabouts of the pirate gang. As Douglas walked on his way, at a turn in the road near to Balligan, but out of sight of any houses, a beggarman appeared in the road before Douglas, and stopped him. The beggarman was the disguise of Commodore Bob, leader of the Merry Hearts; and having confirmed that Douglas was carrying the gold ransom from Matthews, Commodore Bob struck Douglas a heavy blow with a cudgel that broke open Douglas’ head and left him for dead. Having witnessed this murderous act, the six following men of Matthews leapt upon Commodore Bob. A fight, six against one, resulted in three of Matthews men lying disabled on the ground, and Commodore Bob making his escape followed by the remaining three. Across fields, through hedges the men chased the pirate, calling out “Murder”, a cry that brought to the chase others who heard the call, and soon Commodore Bob was being hunted by twenty men, or more. Finally brought to ground, cornered in a small cottage, Commodore Bob was surrounded, and after a furious fight, he was finally seized and bound. The rabble dragged the pirate to an ancient tree a short distance outside of Kircubbin; a rope was fetched and lubricated with cart grease to make the knot slip tight, and this rope was then slung over a bough of the old tree, and a dozen men began to hoist Commodore Bob by his neck. Yet, despite his hopeless situation he refused to give the location of his captive, McFadden. The lynch mob hoisted Commodore Bob by his neck and left him dangling until his body became limp and lifeless. Having forced their rude justice on the pirate, the crowd then discussed how to dispose of the body, because such an evil soul was not welcomed to share a graveyard. The gruesome decision was agreed to carry the body to the remains of Gunning’s old abandoned windmill nearby, and to leave the body to be eaten by the rats, which were in abundance there. Dragged to the abandoned mill, and dumped there for the rats’ satisfaction, the limp body of Commodore Bob was left, assumed to be dead. But, beaten and garrotted though he was, Commodore Bob wasn’t dead. And although it revolted him, in his semi-conscious state, Commodore Bob allowed the hungry rats to approach him because their preference was to gnaw at the ropes smeared with the tasty cart grease. And soon the ropes binding him were weakened sufficiently too allow the pirate to break his bonds and make his escape. Meanwhile, the cudgeled body of Willie Douglas had been taken to the house of Dr Black in Kircubbin. The good doctor had used his expertise to repair Douglas’ wounded head, and slowly bring him back to consciousness. And with little persuasion, Douglas in his disorientation readily revealed the whereabouts of the pirates’ captive, McFadden, concealed and held prisoner in a glen near Scrabo Hill. Mr Matthews immediately organized a band of crudely armed rescuers, and marched them in pursuit to Newtownards. And near the head of this band of rescuers was Daft Eddie, who had already sworn to McFadden’s daughter that he would save her father. It was Daft Eddie, at the head of the gang who carefully made their way up the little river into the glen at Tullynagardy just outside of Newtownards, and it was Eddie who discovered the pirate’s cave where McFadden was imprisoned. The gang of rescuers got tar and paraffin from the town, and made a fire at the mouth of the cave to smoke the pirates out. A shot was fired from the cave, and Eddie fell to the ground. The others rushed forward following Matthews into the cave, where they discovered McFadden well concealed in a deeper cave within, still held by his captors. The pirates had no chance of escape, and were quickly overpowered by Matthews’ men. But Daft Eddie lay mortally wounded. A doctor agreed to Eddie’s request that he be carried home to his familiar townland of Tullynakill, near Killinchy. And there he died of his wound, and there he was buried: a plain granite headstone erected for him bearing the single word: Eddie. The pirates captured within the cave were sentenced to transportation for life. Willie Douglas recovered from his head injury, was pardoned for his assistance in the discovery of McFadden, and returned to his wife, and farming life. But what of Commodore Bob? Commodore Bob, the ruthless leader of the Merry Hearts of Down, had survived his lynching, and survived a cruel fate at the mercy of countless hungry rats, and made up his mind to avoid such justice again. Commodore Bob determined to receive a pardon, in exchange for betraying his fellow Merry Hearts. To this end he made his way to Greypoint on the coast near Bangor, where the revenue cutter, Dart, was moored. Dressed as a fisherman, Commodore Bob sailed a small craft out to the cutter and demanded a discussion of terms with the commander, Captain Nelson. Commodore Bob revealed himself as knowledgeable of the Merry Hearts of Down, and attempted to strike a deal. The pirate asked for reward for betraying the knowledge of a valuable cargo of smuggled goods soon to be brought from the Isle of Man ; he told how he knew all of the hiding places of the Merry Hearts of Down, and would willingly betray the whole gang to the hands of the Government. Captain Nelson did not fully trust Commodore Bob, and had his little boat cast adrift, making him a temporary prisoner on the Dart until his story could be proved. The next day, acting on Commodore Bob’s information, the crew of the Dart kept watch off the Ballyhalbert coast, on the lookout for the expected smuggler schooner, Betty, skippered by expert navigator of these waters, Captain Jenkins. A fierce wind had risen from the south by the time the Betty was spied on the horizon, and on recognizing the revenue cutter laying in wait, Jenkins hoisted every inch of sail available to him, and made for Strangford Bar, cutting close to the reef off Ballyquintin Point. The revenue cutter, Dart was perhaps a mile distant behind the Betty, but pursuing with all available haste. The Dart had a deeper draft than the Betty, and Captain Nelson was not so familiar with the reefs as his opponent was, and this resulted in catastrophe. The southerly gale combined with an ebb tide rushing out of Strangford Lough, created treacherous seas, and sailing too close to shore the Dart snagged on the ragged rocky reef off Ballyquintin Point, and was smashed to pieces, all hands drowned save one. And among those who perished in those violent seas was the pirate leader of the Merry Hearts of Down, Commodore Bob. And that was the end of the most notorious gang of smugglers to ply their trade on the Strangford waters around Kircubbin. There was no famine in Ireland during this period. There was starvation, which was indirectly caused by potato plight. If there was a famine, why did Ireland continue to be a net exporter of food? If there was a famine, why did exports of farm produce from Ireland increase during these “famine” years? However, for the sake of simplicity, I shall refer to the starvation in Ireland at this time as the famine. The second thing to point out is that this isn’t ancient history (my natural grandfather was born in 1845, so in my extreme case the famine is only three generations ago). It is now generally accepted that the famine was caused by the opportunism, apathy, and greed of the then richest empire on the globe. It is true that the potato had become the staple diet of the majority of Irish families (about one-third of whom were dependant on the potato for food), and the loss of this entire crop caused hunger ; but the starvation was not caused by the lack of other food: the starvation was caused by the lack of availability of other foods due to the fact that most of this other produce was forcibly exported to Great Britain. Furthermore, since the failed attempt at revolution by the Society of United Irishmen, Ireland had reluctantly become a part of the Union of Great Britain & Ireland in 1801, and as a direct result of this union there no longer existed any export tariffs to Great Britain from Ireland, so it was cheaper for Great Britain to import food from Ireland than from anywhere else. In the previous famine of 1782 – 1783, Irish ports were closed to keep Irish produce within Ireland to feed the Irish, and this worked well, and kept food prices low. However, during this 1845 famine, Irish exports of farm produce actually increased during the famine years, the food often being exported under armed guard. So that this simple knock-on effect of removing the potato from the basic diet of the population created the inflation of food prices, and the subsequent hunger. But balance this explanation against the fact that food exports from Ireland actually increased during the famine years: there was enough food, but it wasn’t made available or affordable. The Roman Catholic Relief Act had been passed in 1829, and this removed many of the substantial restrictions [see Penal Laws, above] on Catholics throughout Great Britain and Ireland, and thereby finally allowing Catholics to vote. With 80% of the population of Ireland being Roman Catholic, this democracy threatened to seriously unbalance the British authority in the Irish Parliament. With Irish labourers earning a pittance working the small farms owned by their gentry landowners, it was common for an Irish family to be large, so that the elderly parents would have several children to provide for them in their old age. But this quickly growing Catholic population was also seen as a potential democratic threat to the English landowners. Disgusting as it may seem to us today, this potato blight was seen as an opportunity by many landowners to diminish the threat of a growing and democratically active Catholic population. Between the years 1846 and 1851 it has been calculated that perhaps as many as one-and-a-half million people died of starvation (this estimate includes people dying whilst attempting to emigrate: either dying on route, or dying shortly after arriving at their destination, as a direct result of the effects of malnutrition). Add to this 1.5million deaths, an additional excess of another one-million people who had no other choice but to emigrate to Great Britain, United States, Canada, Australia, and elsewhere, with millions more continuing to emigrate in the following decades. If the British landowners wanted a cull in the Irish Catholic population, this natural disaster proved to be their means to an end. Two-thirds of the eight-million population of Ireland depended on agriculture for their survival, but most had to work for their landlords in return for a small patch of land on which to grow enough food to feed their family. And the most productive crop for such small plots of land was the potato, and that is the chief reason why so many families came to depend on the potato as their staple diet. Compared to a typical Irish farm of perhaps 5 to10 acres, the English landlords owned vast estates of many tens of thousands of acres. And the agricultural produce from these great estates was exported to Great Britain to pay for the lavish lifestyles of these landowners. The reason for the widespread forced eviction of Irish farm labourers is simple: Money. Landlords were responsible for paying the rates of every tenant who paid less than £4 in yearly rent. So when peasant farmers had spent their money on food, instead of rent, the landlords' agents actively evicted tenants from small farming plots so that larger more profitable farms could be created. It is estimated that as many as half a million Irish people lost their homes during these years. So how did this famine affect the Ards? Lord Londonderry, who had extensive estates across Ulster, and notably at Mount Stewart on the Ards Peninsula, was very opposed to any relief committees or relief works being established in his north Down bailiwick; rather he stressed the virtues of self-reliance and adherance to a laissez-faire philosophy. He refused to accept that there was any destitution, because by doing to would "sully the credit of Ulster" and be a "disgrace to the province". Protestant newspapers, speeches, sermons, and public resolutions openly argued that there was "no famine in their province", rejecting accusations of misery and starvation as malicious slanders on "the peaceable and industrious inhabitants of the north of Ireland"; Loyalist pronouncements not only denied the existence of the famine, but ascribed hunger and misery only to "lazy, vicious and indolent" Catholics of southern and western Ireland, attributing their plight to "the almighty's wrath against idle, sabbath-breaking repealers". Contemporary accounts of starvation in Newtownards describe people queuing at the soup-kitchen as "emaciated and half-famished souls", many of whom are without sufficient clothes to cover them. The starvation was not only felt by Roman Catholic Irish families: Ulster's Presbyterian populuation fell by 18% during the famine, only slightly less than the 19% decline among Ulster Catholics, compared with a less than 13% decline among Ulster Anglicans. During the Great Famine, Ulster was one of the least affected provinces of Ireland with only 15.7% general decline recorded in the population censuses between 1841 and 1851. In County Down the fall between these population counts amounted to 44,000 people. And on the Ards Peninsula around the Kircubbin area, the fall in population is estimated to have been no more than 10%. However, the Ards south of Kircubbin suffered a population loss a little higher, at about 15%. 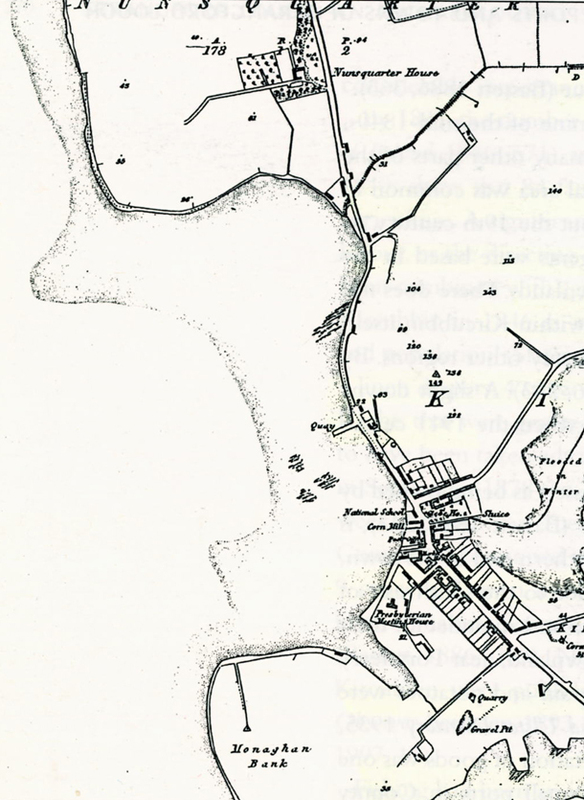 The principal reason for the Ards Peninsula suffering less during the famine was due to the fact that the Ards produced such a wide variety of food: sea fishing and shellfish; cereals and milled flour; sheep meat and wool; cattle meat and dairy. As well as this agriculture there was a strong textile industry, as well as embroidery, and the manufacture of straw hats. And Kircubbin by this time was an important export hub for much of this bounty. So the Ards didn’t suffer so seriously from potato blight when it affected the potato crops in this area, because there was so much other food produced here; but there were serious knock-on effects in so much as the Irish market for locally produced goods had been greatly reduced by widespread poverty in other regions of Ireland. Admissions to the Newtownards Workhouse (present-day Ards Hospital) more than doubled between October 1846 and January 1847, and by July that same year, admissions had doubled again to 426. Despite the economy of the Ards being textile manufacturing as well as a varied agricultural and fishing industries, the knock-on effects of the Great Irish Famine were sorely felt, particularly because of the rise in the prices of basic foods. In the Spring of 1847, soup kitchens were feeding the hungry in Comber, Newtownards, and Ardkeen. The Newtownards soup kitchen was organised on behalf of the Marquis of Londonderry (of Mountstewart) ; the Comber relief was organised by the Andrews family ; and Kircubbin Relief Committee handed out coarse bread with soup here and at Ardkeen. Despite this, conditions at Newtownards Workhouse were blamed as the cause of 74 deaths between August and November 1847. Overcrowding, and the fact that many people came to the workhouse too late and in such weak condition that they were dying anyway. Common coditions brought on by malnutrition were: typhus, relapsing fever, dysentery, and scurvy. When the famine was at its height, around 1847, the Marquis of Londonderry was deeply criticised for his apathy, and ridiculed in comparison to his neighbour, the Marquis of Downshire. Bear in mind that at this very time, the Marquis was refurbishing his mansion at Mount Stewart at a cost of £15,000. Yet Londonderry’s donations to the famine Relief Fund amounted to a total of £30. (£20 from the Marquis, followed by a further donation of £10 from his wife the Marchioness, who was, by the way, by far the wealthier of the couple). This £30 donation from an income from his County Down estates estimated to be £23,000. By comparison, the Marquis of Downshire responded by: donating £10,000 to the Relief Fund ; reducing his rents by thousands of pounds ; and offered full employment around his Hillsborough estates, paying good wages and giving out free soup ; and two days before Christmas he had two bullocks slaughtered and cut up into 4lb pieces [2Kg] to be given, with a shilling, to poor families. Londonderry didn’t even consider reducing his rents. At Greyabbey, Montgomery offered useful work to local unemployed labourers with the construction of a substantial causeway across a little bay on the shorefront of his estate, which is still in constant use today, and as a result of the causeway, created a small fishing lake locally known as the Swan Hole. Not only did the construction of this causeway engage many unemployed labourers, but it was (and remains) a logistical improvement to the road network of the Ards, improving the speed and ease of transportation up and down the peninsula. The following year, 1848 the Marquis of Londonderry finally agreed the sale of land that permitted the extension of the Belfast & County Down Railway across his lands, thereby providing much needed employment for the area ; Londonderry increased his contribution to the soup kitchen to £500 a year ; he established links to his coal mines in Durham, which provided work for some unemployed ; and he provided funds to complete some drainage projects. As you might expect, these horrible years of deprivation and starvation made the populace bitter against the landowning classes. In 1850 tenant farmers formed the Tenant League, which demanded that the custom of Tenant Rights to be formalised in law. However, Londonderry used his considerable powers to quash the League. Tenant Rights had existed informally in Ulster since the Scottish Plantation. Tenant rights gave the farmer the security of knowing that rents would not be increased at random ; and they would not be asked to leave their farms provided they continued to pay rent ; and it also allowed them to sell their tenancy to another farmer approved by the landlord. One visible relic of this tenant right system can be seen with the Ulster field gateposts, which is typically a substantially built circular stone and mortar column with a cone-shaped top. Without the long-term security of tenant rights to their farms, these gateposts would never have been constructed by farmers. Following his death in 1854, a group of admirers proposed the building of a monument to the Marquis of Londonderry. And the foundation stone of the Londonderry Monument [Scrabo Tower] was laid in March 6th 1857 on the top of Scrabo Hill. However it would be an exaggeration to pretend that this tower was paid for by contributions from grateful tenants : in fact over two-thirds of the donations came from fellow landowning friends of Londonderry’s, (first on the list of donors was Emperor Napoleon III of France). The information written hereabove is collected from scores of historial documents and authenticated sources, and the author has genuinely attempted to represent an objective and accurate account of each subject. If you have any objections to any recounted facts, or feel that people or events have been misrepresented, please direct your criticism at the author.